WhatsApp was founded in the year 2009 and in just six years it has succeeded in acquiring 1 billion users worldwide. No other instant messenger has been able to achieve this phenomenal growth in such a short period of time. 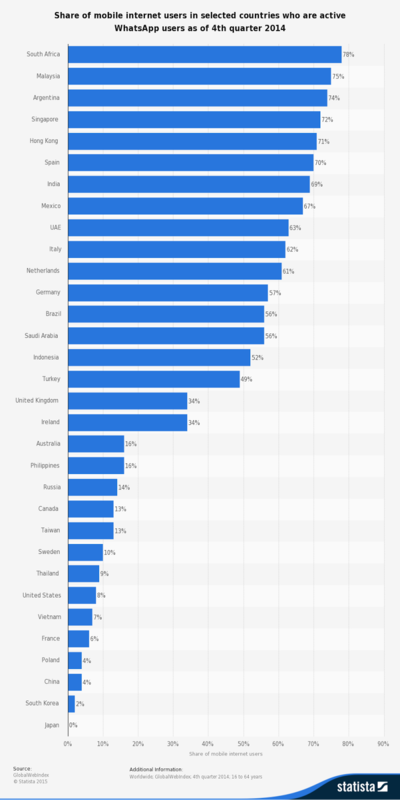 Moreover, about 1 million new users register everyday so you can assume the potential reach it will have in the coming few years.South Africa is the top country using WhatsApp with highest % of online adults in this market. When it comes to business, Brazil leads the way. With 56% WhatsApp penetration among mobile internet users, Brazil still has 60% of mobile users who use pre-paid plans as per a report by Statista. WhatsApp is the single most used app in Brazil with over 95 million users and 93% of country’s population. The core reason being the cost-effectiveness and no obligatory monthly mobile bill contracts for those who cannot afford to spend on those expensive plans, especially the youth and the poor. Large multi-national corporations and small businesses too have already started use of WhatsApp for business in Brazil. Telefonica, one the of largest telephone companies in Brazil uses WhatsApp for customer service. Real estate firms sell properties to middle class population using WhatsApp. Right from online shopping to flight booking, everything that people need has a source to get it done through WhatsApp. Brazil is one of the best example of a country using WhatsApp for business. WhatsApp in Brazil is not just limited to customer service, Mitsubishi Motors used WhatsApp in 2014 for pre-sales tasks such as providing car color, models and other details to potential customers and if the customer liked it, they were then directed to a local dealer for the test drive or purchase. Around 1 in every 5 companies in Brazil use WhatsApp for advertising and marketing. Itau Bank is one of the largest bank in Brazil that uses WhatsApp for communication with their customers. Many hotels and resorts accept bookings and orders using WhatsApp. There are many other functions that are carried out routinely on WhatsApp in Brazil. Speaking about other countries, US is bit slow to adapt to WhatsApp as of now. Germany, UK, Italy, Ireland, Argentina, Spain, India, Malaysia, Indonesia, Singapore and Australia are showing signs of quick adaptation. 83% of teens in Germany use WhatsApp, India has more than 70 million users and Italy, Argentina has more than 83% of mobile users using WhatsApp. UAE too has 77% social media users that use WhatsApp for communication. To sum it up all, using WhatsApp for business seems to offer numerous opportunities to businesses all over the world. A business can absolutely not afford to neglect using WhatsApp for advertising, marketing, sales, project management or customer service. Bag A Chat provides a seamless way of using WhatsApp for business with an integration of customized application that suits every business need. Find out more here how you can use Bag A Chat app with WhatsApp for business.